Iron pipe shelving has been popping up everywhere. You can easily find an iron pipe project that will suit just about every room in the house. They are sturdy, sleek, modern, and so easy to put together a novice could do it. When deciding where to add these contemporary beauties to my home I quickly settled on the kitchen. Mine is rather small and I desperately needed more storage. The kitchen has a big beautiful window that I didn't want to block with large wall cabinets and I decided that open shelving would be the perfect solution. So pick a room for installation and start building with me! I began by prepping the walls. Up until this point they were a stark white and I wanted to add some contrast to the room. I chose a shade of dark grey called Peppercorn by Sherwin Williams and painted the wall I planned to install the shelves on. Once the paint dried I pulled out my stud finder and marked the location of all the studs in pencil. Start by cutting and gluing your shelves. I wanted the shelf to be a bit thicker than the standard ¾” you’ll find in all the big box hardware stores. I solved this by gluing two boards together with some wood glue. 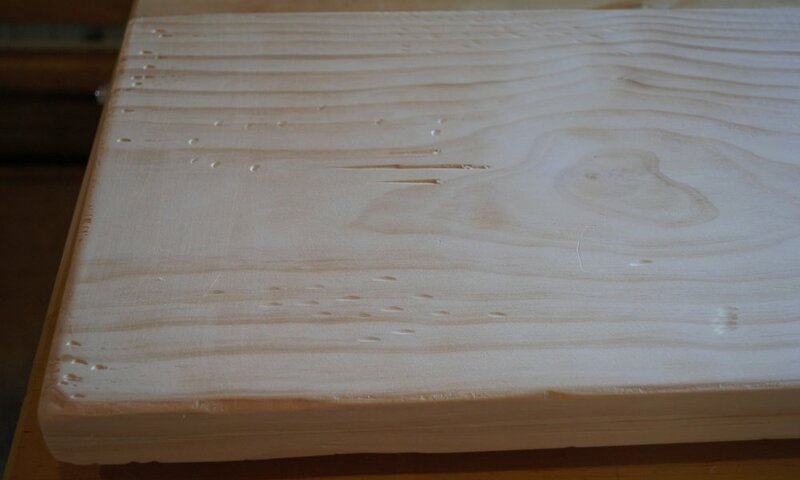 After cutting each board to length, spread a thin, even layer of glue on one side of both boards. Place one board on top of the other, glue sides facing, and add a few clamps to hold the boards in places tightly while the glue cures. Be sure to use a damp rag to wipe away any glue squeeze out. While the glue sets you can move on to the shelf brackets. Before assembling the brackets make sure to give all the parts a good cleaning. You can use rubbing alcohol or mineral spirits for this. It will pull off any residue sitting on the pipes. After a good wipe down go ahead and start assembling. Attach a flange to one end of the pipe and a cap to the opposite end, make sure they are screwed in all the way (there will be some threading still visible on the pipe). Decide the placement that suits your space and mark the four holes on one of the flanges. If you are not drilling into a stud make sure you install wall anchors in the four holes before you attach the bracket. Once the first bracket is installed, use your level to mark the height of the accompanying bracket and repeat the above steps to attach it. When the glue cures, remove the boards from their clamps. If the boards are not perfectly flush, run them through a table saw to bring them even. Alternatively you can use a hand plane or a circular saw to do this. Optional: Using a bench chisel, cut grooves and gauges along the wood to give it a distressed look. Hit the wood with any metal object you think with produce an interesting mark, i.e. clamps, screw drivers, chains. After you are happy with the look move on to sanding. Start with 80 grit and move through 220 grit sandpaper. Remove all dust with a damp cloth and crack open your stain or paint. Once the shelf is dry place it across the two brackets and there you have it, a beautiful shelf you made yourself. I hope you enjoyed building with me, see you next time!